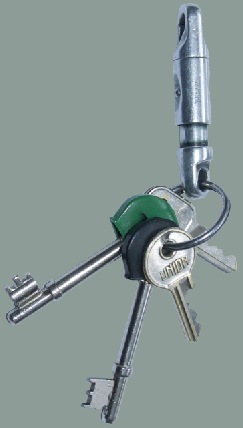 Le hooks were designed and manufactured in Switzerland. Ground out of one entire piece of aluminium, le hook is a showpiece of Swiss craftsmanship. Its precision and durability are unparalleled. Now, the remains of the original production are again sold directly from Switzerland. Find out more about us on www.klotzli.com. I bought a le hook in Paris over 25 years ago. I liked the look of it because it was like nothing else I'd ever seen. It has been on my house keys ever since. 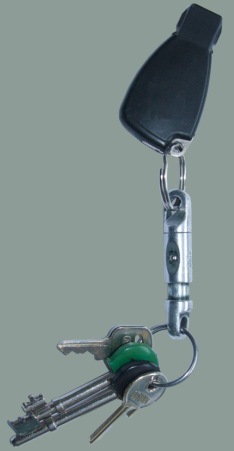 I never liked a large bunch of keys hanging from my car ignition after I had to replace two ignition's over the years due to the weight of my keys constantly swinging on the car key. le hook was the answer because I could use it to clip my house keys to my car keys, or my motorbike keys when I wasn't driving. It was originally Black, but has gently weathered to a wonderful polished Aluminium colour. A while ago I lost my keys after a friends wedding and spent 2 days looking for them. It was then I realised that it wasn't the loss of the keys that I was bothered about - it was that funny hook thing. I had frequently searched for le hook online but all I found were other people searching for them. So I spent a lot of time and energy tracking down the only remaining stock of the Original Swiss made le hook in the World - and here we are now selling le hook all over the world. Europe, Japan, America, Canada, Australie, New Zealand and the Phillipines to name a few of the places on our invoice list. We have just added some new varieties to our online range which we discovered deep in the vaults in Switzerland and are proud to now offer the full original range in all colours available.